A customer from New Jersey sent us some awesome shots of her front dining room that she recently decorated using some of our mouldings. 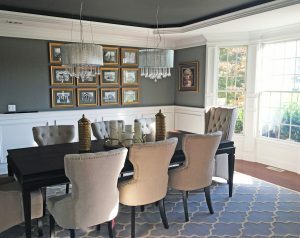 As you can see, the moulding perfectly accents the room and the walls. At Architectural Depot, our urethane panel moulding come primed and ready to be painted to your desire! They are lightweight for quick and easy installation. Plus there are hundreds of different sizes and styles to choose from! Check out our selection of panel moulding using the link below!